See the historical highlights and cultural delights of Houston on a 75 minute guided evening tour. 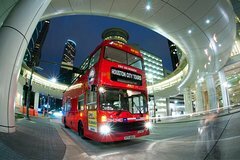 You will have the best views of Houston as you travel through the city on the top deck of a double decker bus.Take in the city lights and listen to fascinating live commentary as you cruise past important landmarks. See popular attractions like Market Square, the Downtown Aquarium, the Theatre district, Texas avenue and the Buffalo bayou. Come see Houston's Billion dollar skyline. start your tour from a amazing texas cowboy themed Visitor Center.